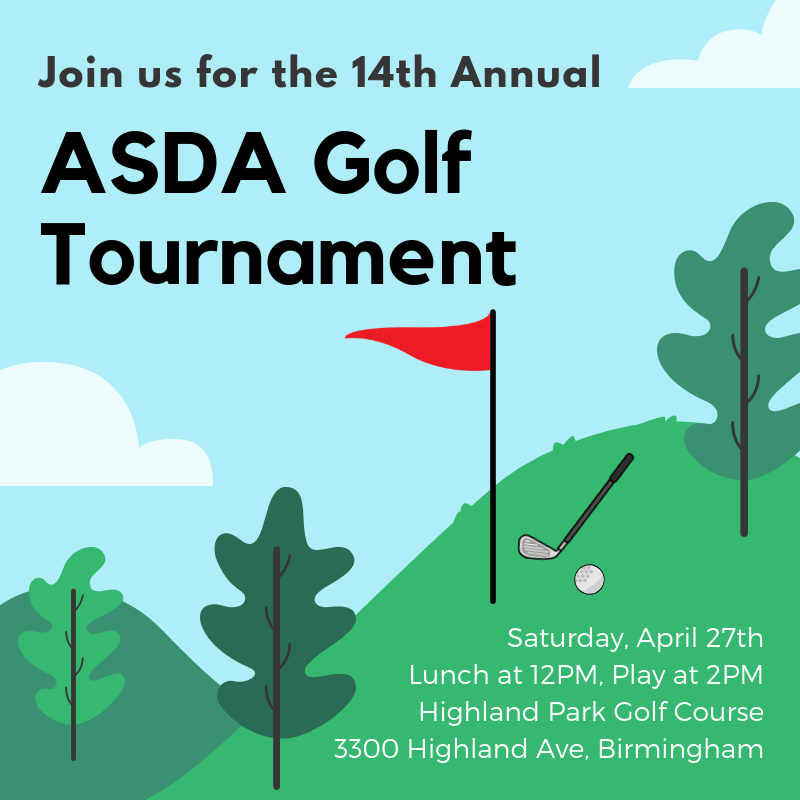 The ASDA Wide Open is a golf tournament held annually by the University of Alabama School of Dentistry's chapter of the American Student Dental Association (ASDA). The event is in its 14th year. The tournament is open to anyone so if you would like to participate, please sign up and contact us with any questions! The tournament will be held at the Highlands Golf Course on Saturday, April 27th; registration and lunch will begin at 12pm. Registration for the golf tournament includes lunch, two drink tickets, and a T-shirt. At this time there will also be golf balls set up at the range. The shotgun start will begin at 2pm and will consist of a scramble format. There will be prizes for the 1st, 2nd, and 3rd ​place teams! Please register as a team of 4. Register your team at the link here. If you do not have 4 people, please let us know. Cost is $45 for dental students and $60 for non-students. If you don't want to play golf, we still have a fun-filled day for you! We will be having a social event above the Highlands Golf Course clubhouse. We have rented out the ballroom and will have music, food, and drinks. Your ticket will include food and keg access. If you don't want beer, we will also have a cash bar. Two free drink tickets will be given out per golfer with your team registration and purchase. Come out and support ASDA, have a few laughs with your friends, and watch the golfers shank a few balls! Lunch will be served at 12pm, and the event will last until around 6pm (when the golfers are done). If you can't attend the event, T-shirts are still available for purchase. Extras can be purchased using the other PayPal button. ​Please contact Cody Hughes (cahughes@uab.edu) or John Davis Diaz (jddiaz@uab.edu) with any questions. For more information about the golf course, please visit http://www.highlandparkgolf.com/.